My wonderful SOF Friend karen & her DH Steve called in for a few days on their long awaited Holiday, they are making their way from Rockhampton to Tassie. They arrived late afternoon yesterday and we started our time together with a lovely BBQ cooked by John and a gorgeous lemon yoghurt pie for dessert, mmmmmmm. We then sat up to very late chatting. 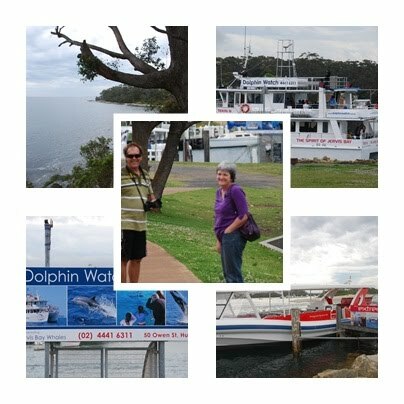 This morning we decided after a fairly late start to head out to Jervis Bay. Karen was told we had the whitest sand in Australia and she wanted to see it. I took them to Huskisson as the first point of call and told them we would work our way down to a few more beaches. We parked at the Husky Pub car park and wandered along the water down to the wharf. As we did one of the dolphin cruisers was coming. We decided to watch it moor and as we did I was pretty sure my BIL Glenn was the skipper. When I heard his voice I realised it was, so I called out to him. Well to cut a long story short we ended up on his next trip out - on the Extreme Boat to do a lit bit of Dolphin and hopefully whale watching. He had just seen a few whales on the trip he just came back from. We headed out to Point Perpendicular, saw a huge pod of dolphins - who are extremely hard to photograph - wandered along the edge of the cliff to see the amazing rock formations and then headed back into the bay as another boat had spotted whales. 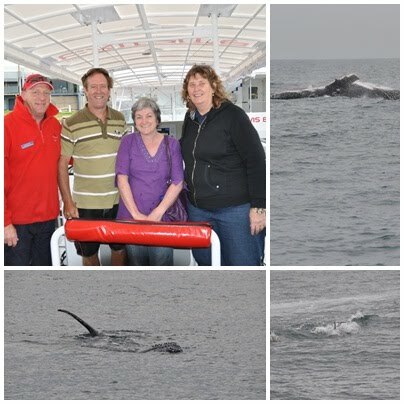 This is the 3 of us with my BIL Glenn, the skipper (in red jacket) and few pictures of the amazing whales. We witnessed quite a show - there were two pods, 2 mother humpback whales and their calves and they gave us the most amazing feeding show. 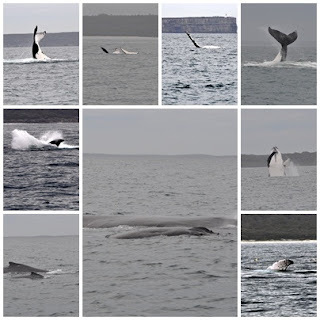 Then they had a wonderful time playing around, flapping their pectoral fins, waving their tail around, breaching a few times and at one point one mother whale bought her calf almost right up to the boat for us to see. WOW that was so amazing. 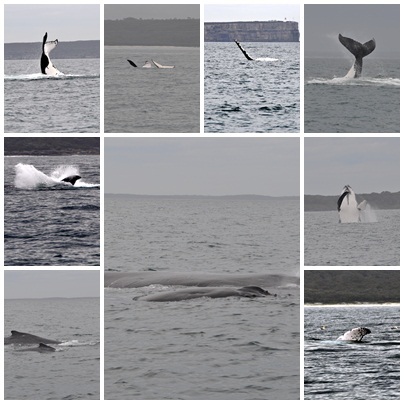 The large photo in this collage is showing how close the whales came to our boat. Needless to say after this we didn't get to the other beaches, but I don't think any of us were disappointed. we finished the day of with a beautiful roast lamb dinner and chocolate tart. Cathy, Kyle & Tasha came over and joined us for tea also. This was the first time Cathy & Karen had met so that was pretty special. 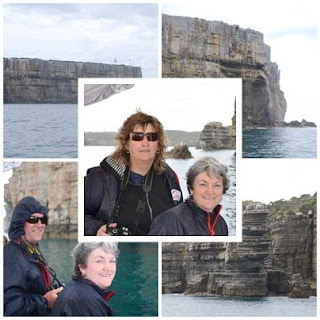 A big thank you to Cathy who told us about photoscapes a free download that allowed me to make these great collages very quickly. Wow Gail those pics are just great, especially the whales I would love to be able to see them up close . You live in such a beautiful place. Great pictures! Love the photoscapes and I'll have to have a go at these as blogger can be a pain with their photo limits :(. Hey Gail just finally getting a chance to sit down and catch up on everyone. It was a really amazing day - and it was SO GOOD to catch up with you and Hayley, met John and Royce and Cathy and her kids. We will always hold very special memoires of our time with you and thank goodness for the best laid plans going astray. It definately was an awesome day.